Concordia adopted an official sustainability policy meant to guide the school a few months ago, but no concrete action plans have been put in place since then. But that is supposed to be changing soon. 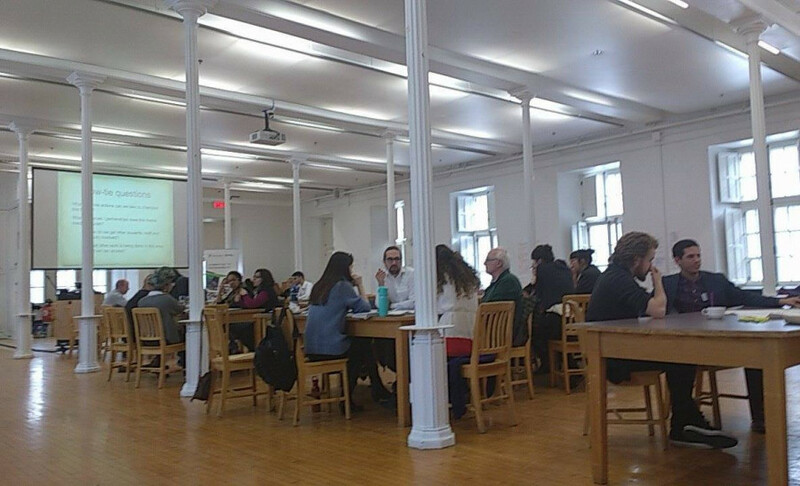 Students, faculty and staff were free to come in to a public consultation in the Grey Nuns building, with the goal of giving the university direction on how to best implement the points made in the policy. The consultation took place Wednesday evening, but left some unsatisfied. Many of those who attended came from Divest Concordia, the Concordia Student Union, and Sustainable Concordia. Sustainable Concordia has been pushing for the school to adopt a sustainability policy since 2009. The policy itself creates several guiding principles on topics like environmental protection, responsible production and consumption, ethical financial management, and the protection of cultural heritages. Coté said the suggestions brought forth in this consultation will be used to guide Concordia’s sustainability “action plan,” meant to be implemented fall 2017. Those with the final say on what goes into the plan come from Concordia’s sustainability advisory committee. Chaired by Coté, it’s the main decision-making body for sustainability projects at Concordia. The majority of its members come from the university’s administration, though some student representatives sit on it as well. Before coming to the consultation, surveys were given to attendees so that they could rank what they considered to be the most important issues for the school to tackle. Chief among those concerns was how the school plans to tackle climate change. Or put more simply, the school’s move towards divestment of fossil fuels. That wasn’t listed as an option for ranking, but it was a concern for many of those who put climate change as the most important issue for the school. The second highest concern was making the campus more diverse and accessible. That would include making the campus more accessible for those with limited mobility, and also the introduction of Indigenous studies across all faculties. The third highest concern was how food systems could be improved on campus, whether that be by increasing the vegan options on campus, buying more from sustainable food providers, or decreasing the cost for food contracts that are taken on by students living in residence. But some we’re left dissatisfied from the experience. Most of the event, stretched over three hours, was allotted to attendees writing on posters about what wanted to be considered by the sustainability advisory committee. Only about half an hour was left for discussing those wants. “My impression is that Concordia is carrying out a public relations effort in to attempt to show that they are moving in a sustainable direction. But the reality is different,” said head of Green Party of Quebec and student in environmental science, Alex Tyrrell. People split off into groups to discuss suggestions based on particular topics, whether it be waste management, food systems, or climate change. But each group was only allocated three minutes to talk. Tyrrell explained the consultations could have been taken more seriously. “In formal government consultations you generally have commissioners who table, and each person has a right to present for ten or fifteen minutes verbally, and also submit a written brief,” he said. Alex Leonard, a member of Divest Concordia was thankful for the event because it helped open up room for communication, but wished there would have been more members of Concordia’s Board of Governors present. He also found that the use of posters made the consultation a bit childish. “At the end of this day, this is just going to be recycled. So I think this is kind of just silly,” he said. In response to students’ demand for divestment, the Concordia University Foundation, in charge of the school’s investments, carved out $5 million to invest in sustainable investments in October of 2015. This $5 million is subject to recommendations from the Joint Sustainable Investment Advisory Committee. That committee met the day after the consultation. “We’re now at a stage where we’ve had the opportunity to discuss making actual recommendations to the foundation,” said member of the committee and former General Coordinator of the CSU, Lucinda Marshall-Kiparissis. She said much of the discussion then was influenced by issues that we’re brought up by students at the consultation. She also mentioned that no one else from that committee came to join in on the consultation. But she thankful that Concordia’s Chief Financial Officer, Denise Cossette, made sure to attend.